Don’t toss that cork! There are countless creative—and useful—ways you can upcycle it. Need bag clips or a pot lid holder? Grab a few corks. How about a mini magnetized planter? Try a cork. A key chain floater and cord wrangler? Corks. A pretty way to identify the types of cheese on the tray? Corks! 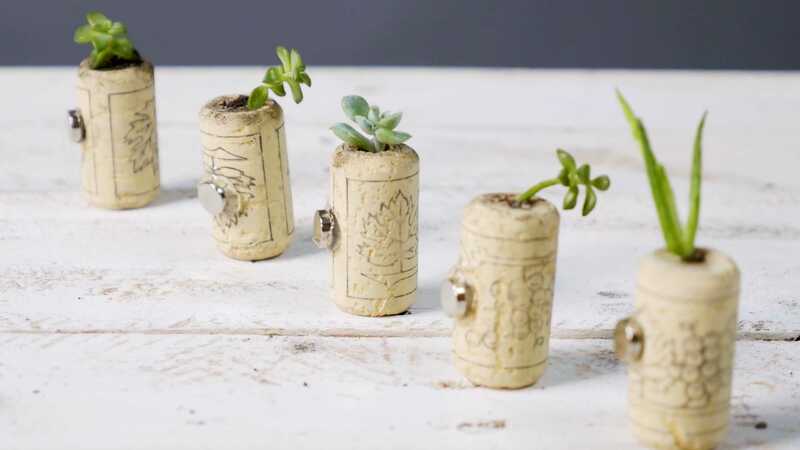 Warm-up your green thumb with these thumb-sized cork planter magnets. Stick them on the fridge or any metal surface to add a wee little green to any room in your home that needs it. Use a hot glue gun to attach magnets to the corks. Let them dry overnight. Once they've had at least 24 hours to dry, drill a single hole in the tops of each cork, stopping about halfway down. Make the hole as wide as you can without ruining the cork edge. Fill the remainder of space with soil, being sure to cover the roots. Spray the soil and cork slightly with water. This will help secure the succulent into place. Water as needed to nourish your little plant. We've all done it–grabbed a hot lid over a boiling pot, not realizing the lid is actually too hot to handle. This super easy DIY provides a safe solution to removing hot lids without burning your fingers in the process. Glue two corks together with a glue gun, making sure to glue the long sides together, not the tops. Place the cork holder under the handle of a hot lid, so the tops are facing outward. Grab the corks by the tops to lift the lid, making sure to avoid touching the lid's hot handle. These adorable cheese board cards are a must-have for your next party or event. And don't just stop at cheese! Label your desserts, entreés, appetizers–anything and everything that might cause your guests pause. Slightly shave off one side of the cork with an X-Acto knife, so the cork will rest easily on a flat surface and remain in place without rolling away. On the other side of the cork, slice a slit up and down, from end to end, that will hold the card in place. Write the names of your cheeses and place the cards into the wine cork holders on the cheese board. An adorable way to differentiate your herbs is to label them with these handy little cork plant identifiers. This project takes merely 2 minutes–plus the time you spend finishing bottles of wine. Use a marker to write the name of your plant on a cork. Stick a toothpick or skewer into each cork, and stick the other end into your plant pot to identify it. Loose and tangled wires are a nightmare for anyone who is trying to get organized, or simply find what they need amid the tangled mess. Make it easy on yourself with these cork cable wrangles. They'll keep your wires in place so you can keep your sanity in place. Drill 2 holes, one inch apart, all the way through the sides of the cork. Thread the holes with a stretchy cord to create a loop on one side. On the other side of the cork, knot the ends to secure the cord. Tip: if you don't have any stretchy cord on hand, use a hair-tie, simply cutting into it on one side to create a single strand. Wind up your messy cables and loop the cord around the wires and over the cork to secure. Keep your bag of chips from going stale or your flour from creating a mess in your cabinets. 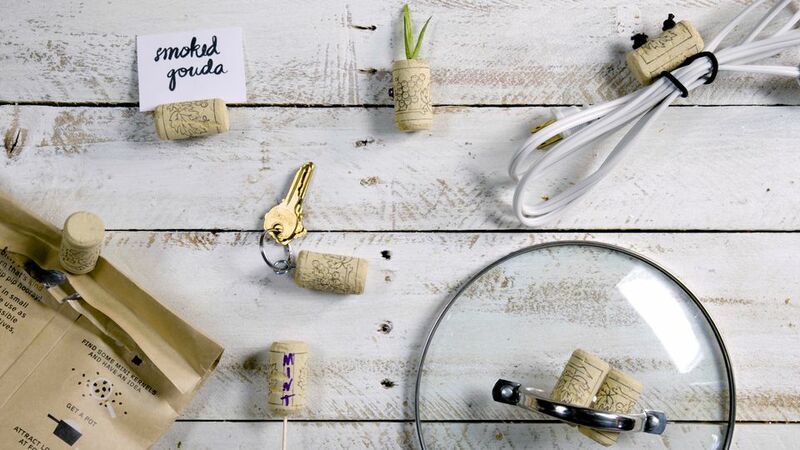 These cork clips work just as well as any bag clips–but they're greener than plastic and more economical than store bought–not to mention a good excuse to open a new bottle of wine. Use an X-Acto knife to slice through the top of the cork, about 1 inch deep or halfway through the cork. Fold over the edge of your bag and slide it into the slit cork to secure. Never worry about losing your keys in the water again. This nifty key floater is an easy DIY that will save you a big headache should you ever drop your keys off a boat, at the beach or by a pool. Screw an eye hook into the top of a cork. Attach a keyring with a key. When the holidays arrive, take a festive approach and turn your corks into a Christmas tree! With a little fabric, paint, and hot glue, you can make the cutest trees to create a rustic Christmas scene on your mantel, shelf, or table.